The Eastin Hotel Penang has successfully carried out its Corporate Social Responsibility (CSR) by sharing its successes with the community during the fasting month of Ramadan for the third consecutive year. 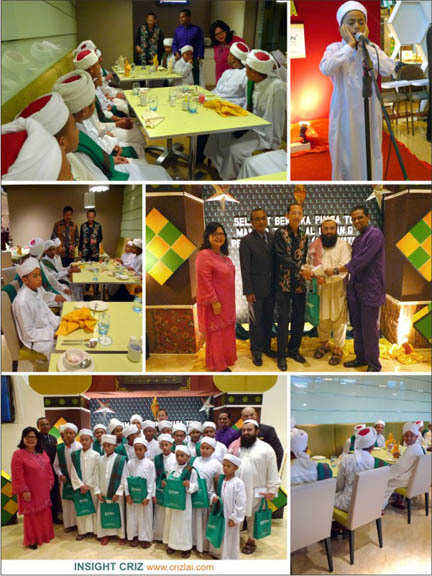 This year, about 25 orphanage children from Maahad Tahfiz Al-Quran dan Pengajian Islam (Anak Yatim) Darul Tahzib, Teluk Kumbar, Penang, have the privileges to join the management for a delectable buka puasa buffet dinner at the Swez Brasserie on 25 July 2012 recently. Other than receiving goodie bags courtesy from Eastin Hotel Penang, the orphanage received RM1173.00 collected amongst the staff as donation. Eastin Hotel Penang General Manager, Ms Mary Ann Harris was happy to have all the children presence during a photography session. Thanks to the Eastin Hotel Penang team for putting up such a memorable Ramadan Buffet Dinner for all the orphanage children. The amount of dishes served during the Ramadan Buffet Dinner was humongous. There was the hawker section serving dishes such as Roasted Whole Lamb, Roasted Whole Turkey, Shawarma with Stuffed Pita Bread, Gear Box Soup, Bubur Lambuk and Ice Kacang with condiments whereas the Action Counter had Popiah, Seafood Grill Corner and Laksa Johor. The selections at the Salad Bar were impressive as well. There were Tomato, Carrot, Cucumber, Corn Kernel, Onion Ring, Marinated Olives, Lettuce served with Thousand Islands Dressing, French Dressing, Italian Dressing, Pesto Dressing and Vinaigrette Dressing with Condiments. There were also the Mushroom Salad, Kerabu Sotong, Jelatah (Pineapple & Cucumber Salad), Kerabu Ayam, Turkey Ham Salad, Egg Mayo Salad, Kerabu Udang, Hummus, Ulam-ulaman, Tempeh, Sambal Belacan, Sambal Cincaluk, Sambal Acar Buah, Acar Rampai, Sambal Ikan Bilis, Sambal Ikan Masin, Telur Masin, Keropok Ikan, Keropok Lekor, Keropok Udang, Ketupat, Lemang, Serunding Ayam, 5 types of Jeruk (pickles), Buah Kurma Madu Yusut Taiyoob, Fresh Oysters, Tiger Prawns, Scallops, Mussels, and Assorted Cold Cuts such as Smoked Duck, Turkey Ham & Chicken Ham. The Soup Section consisted of Clam Chowder, Sup Ayam Berempah, Bread Roll and Butter. The Curry & Hot Dishes Sections were also superb. It had Beef Rendang, Ikan Keli Masak Berlada, Gulai Udang Nenas, Sotong Kari Lemak, Bergedil Sayur, Kari Ikan, Ekor Lembu Masak Merah, Spanish Omelette, Lobster Thermidor, Baked Fish with Spices, Curry Beef with Bamboo Shoot, Ayam Kampung Masak Lemak, Pajeri Nenas, Lamb Green Curry, Stir Fried Bamboo Clam with Black Bean Sauce, Braised Beancurd with Seafood, Belacan Fried Chicken, Assorted Vegetable, Nasi Minyak and Steamed White Rice. The Dessert Section was also remarkably mouth watering. They have a chocolate fountain with skews of dried fruits & marshmallows, Local Seasonal Whole Fruits, Assorted Fruits Platter, Assorted French Pastry, Whole Cakes, Coffee Mousse, Bubur Jagung Dengan Sagu, Bread Pudding and Local Kuih. Beverage Section consisted of Air Bandung, Soya Milk with Cincau, Mata Kucing, Teh Tarik, Kopi Tarik, Ice Cream, Coffee and Tea. Come and enjoy the vast spread of authentic style Ramadan Buffet Dinner at Swez Brasserie @ Eastin Hotel Penang. 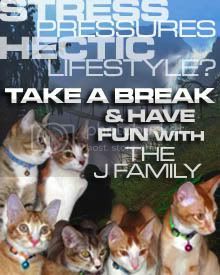 Adult would be at RM85++/pax while child would be at RM43++/pax. For MAYBANKARD, VISA, CIMB, UOB and CitiBank card members, you can enjoy 15% discount for the Ramadan Buffet Dinner from 6.30pm – 10.00pm daily (21 July – 18 August, 2012).